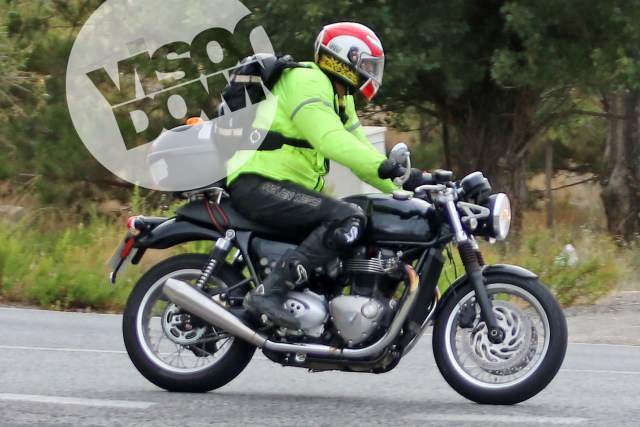 HERE are three new liquid-cooled Triumph Bonnevilles, spotted undergoing tests in Spain. The shots provide a fresh look at the new entry-level version of the the Bonnie, last seen in July, as well as two previously-unseen higher-spec models. 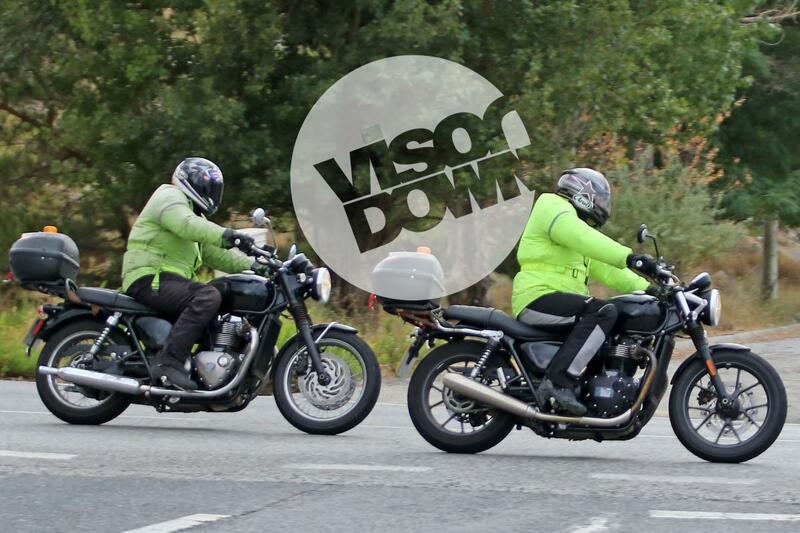 The shot on the right shows the base-edition of a new café racer version of the Bonneville. A higher-spec version of that - probably the 'R' variant - was photographed last December. Then it had upside-down Öhlins forks straight from the Speed Triple R, adjustable Ohlins S36 twin shocks and four-pot radially mounted Brembo brakes. On the version seen here, those components have been swapped for cheaper alternatives, including right-way-up forks. The main image above shows the new entry-level model followed by what is probably the anticipated replacement for the Bonneville 100. The café racer and T100 replacement are expected to have an all-new 1100cc liquid-cooled parallel-twin engine making around 90hp - 22 more than the 865cc air-cooled twin in the current Bonneville. The new base model may be smaller than 1100cc. The café racer and T100 replacement also have twin front brake discs where the base model has one, like the current Bonneville. The only other new Bonneville model expected to have the same single disc and lower capacity is a bobber version which was spotted in July. On all versions, fins on the engine mimic air-cooling but a large radiator between the exhaust downpipes suggests otherwise. The café racer version could be called the Street Tracker, which has been trademarked by Triumph, or the firm could revive the Speed Twin name.